Michael Lewis and Mark Wilkins looked strong in the No. 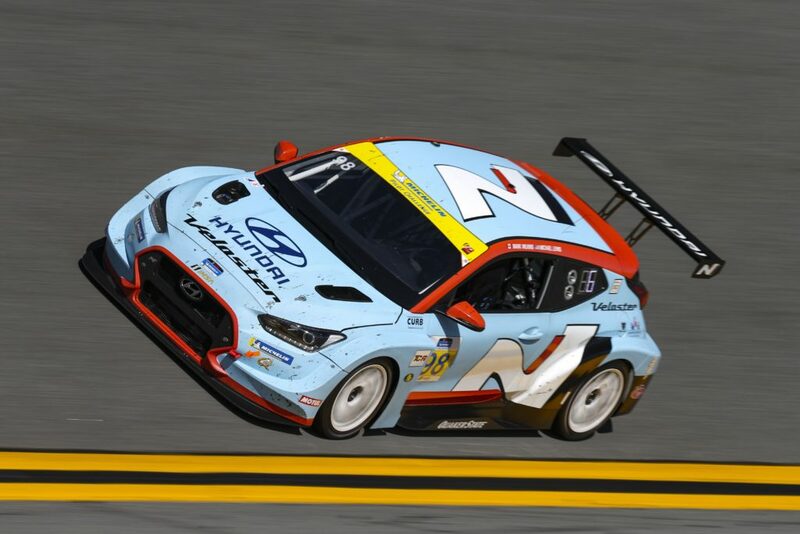 98 Hyundai Veloster N TCR of Bryan Herta Autosport during Round 1 of the IMSA MICHELIN Pilot Challenge. Photo by Michael Levitt/LAT Photographic. Michael Lewis prepares for the start of the IMSA MICHELIN Pilot Challenge season at Daytona International Speedway. Photo by Andrew Modena. 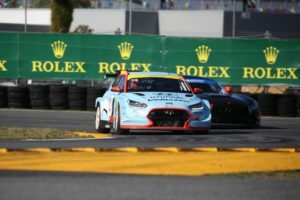 With each practice session, the #21 and #98 drivers worked diligently with their engineers to acquaint themselves with the Veloster N TCR and its response to set-up changes. As this progress developed, so did the performance and the lap times. Mark Wilkins set the 8th fastest qualifying time Thursday afternoon, while Mason Filippi was 13th. Teammates Mark Wilkins and Michael Lewis strategically passed competitors from their eighth starting spot up to a race best of second. Photo by Andrew Modena. Cool temperatures and sunny skies greeted the teams for the race on Friday. 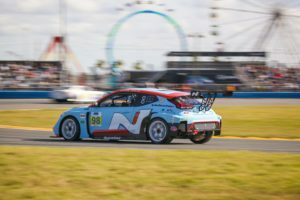 The two-car Hyundai Veloster N TCR team ran inside the top-five several times in the four-hour event, with the #98 car driven by Mark Wilkins and Michael Lewis running as high as second on the high banks of Daytona. From the green flag until the checkered flag, the four-hour race was action packed with intense competition and lots of carnage. Mark Wilkins had a great start and had strong race pace, turning the car over to Michael Lewis in fourth position after completing one stint. Lewis settled in early, with three quarters of the race ahead. An issue in the first pitstop pushed him down the charts, but it wasn’t long before he was working his way back through the field. Mid-race contact with the Honda Civic driven by Ryan Eversley ultimately ended the day early for the #98. Eversley was deemed responsible for the contact and penalized for the incident. The BHA crew made several stops in effort to bandage the car, but the damage proved to be too severe and retired on lap 76. The #98 team held on long enough to collect points for ninth position. Both the No. 98 and No. 21 of Bryan Herta Autosport visited pit road during Round 1 of the IMSA MICHELIN Pilot Challenge. Photo by Michael Levitt/LAT Photographic. The BHA sister car, the #21 driven by rookies Harry Gottsacker and Mason Filippi finished fifth. Filippi started 13th and quickly accelerated through the field to sixth. A long pitstop sent Filippi back to his starting position, but once again he worked his way back toward the top-five. While Filippi consistently ticked off competitive lap times, Gottsacker observed from the pits, waiting patiently for the signal to get ready. Just over half way through the race Gottsacker took over driving duties. Trouble during the pitstop delayed his race debut even further, Gottsacker had a sizeable job ahead to get the car back into the top five. Shortly into his stint Gottsacker knew something was amiss. Focused on collecting as many points as possible, Gottsacker remained in the race and stayed consistent until he was forced to retire three laps before the checkered flag. 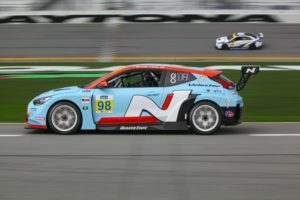 It was not the way the young rookies wanted to finish their IMSA debut, but their patience paid off, they secured fifth place despite their retirement. The team now turns its focus to their next challenge, the Alan Jay Automotive 120 from the historic Sebring Raceway on March 15th. Watch the action from Daytona on Wednesday, February 6th at 1pm ET on NBC Sports SN. Bryan Herta Autosport team owner Bryan Herta, center. Photo by Andrew Modena. After another car made contact with the No. 98 Hyundai Veloster N, Michael Lewis brings the car to pit road for repairs. Photo by Andrew Modena. Bryan Herta Autosport’s No. 21 and No. 98 in the paddock of Daytona International Speedway. Photo by Andrew Modena. After contact was made during the race, Michael Lewis and Mark Wilkins were still able to finish 9th in their first race of the 2019 season. Photo by Andrew Modena. 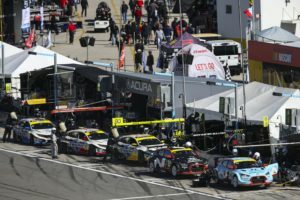 Michael Lewis and Mark Wilkins are now focusing on Round 2 of the IMSA MICHELIN Pilot Challenge, which will take place on Friday, March 15, at Sebring International Raceway. Photo by Andrew Modena. 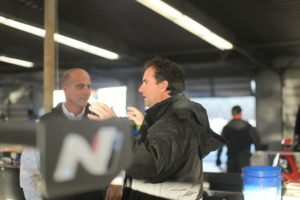 Founded in 2009, Bryan Herta Autosport has grown from a single car Indy-Lights team into a championship winning auto racing franchise. 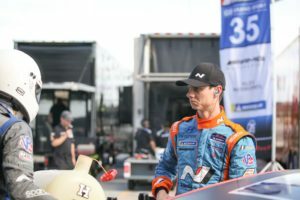 Led by IndyCar and Sports Car star Bryan Herta, Bryan Herta Autosport has won races in every discipline they’ve entered, including Indy Lights, IndyCar, Global Rally Cross, and Pirelli World Challenge. BHA rose to prominence after winning the 2011 Indianapolis 500 in what was the final race of the Centennial Era, a celebration of 100 years of racing at the Indianapolis Motor Speedway, with driver Dan Wheldon. Five years later, BHA partnered with Andretti Autosport, and defied the odds again, winning their second Indianapolis 500 with rookie driver Alexander Rossi. BHA entered the Global Rally Cross Championship in 2015 under the name Bryan Herta Rallysport, scoring multiple podiums and wins. In 2018, BHA entered the Pirelli World Challenge in partnership with Hyundai and dominated the TCR class, winning seven races with drivers #98 Michael Lewis and #99 Mark Wilkins in the Hyundai i30N TCR, securing the team and manufacturers championships in the process. For 2019, BHA continues its successful partnership with Andretti Autosport to field the #98 U.S. Concrete Honda w/ Curb Agajanian in the IndyCar series for driver Marco Andretti. Also, in 2019, BHA takes their championship winning Hyundai TCR team to the IMSA Pilot Challenge where they will enter the #98 Hyundai Veloster N TCR for Michael Lewis and Mark Wilkins and the #21 for Harry Gottsacker and Mason Filippi. 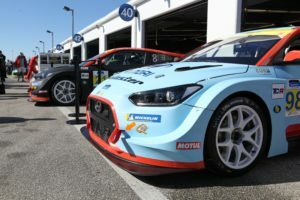 Bryan Herta Autosport is the U.S. sales agent and parts support representative of Hyundai TCR race cars for customer teams. For more information, visit www.BryanHertaAutosport.com. This entry was posted in News on February 3, 2019 .